Got started about 1230 on 7/9 and decided to seine the east arm of my pond again. The same one we had pulled all of the carp out of before. Well NEfish was a little under the weather so he didn't get to partake in the carp seine. So we will blame our failure on him. Anyway, this time we attached 2-100' ropes on each side (1 to the float line and 1 to the weighted line) so that we could stand on dry ground to facilitate the pulling of the net. That worked great but.......... as we finished I noticed there were a couple spots the weighted line and float line got tangled and/or crossed. Needless to say, we caught very few fish. In fact 3 was the total. Lesson #2342 in seining: apply nearly all pulling force (or all of it when applicable) to the weighted line. In fact, in the second pond (which I will tell about shortly) we let the float line drag behind with no force at all. About this time NEfish shows up (looking very poor). His soon to be father-in-law has a pond with an overabundance of small crappie, so we decided to seine there. This pond has a small (30' x 30') island on it so we swam the rope over to it and then pulled one end of the net over. From there, we swam that end of the rope over to the far bank and began pulling the net so that we could span as much of the pond as possible. We had 5 guys and we were all on dry ground pulling. 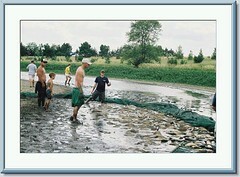 If you have seined before you know that it is almost impossible to pull a 100' net while standing in muck. But this time we only pulled the rope that was attached to the bottom weighted line and let the float line go on its own. It took us about 15 minutes and a whole lot of muscle to get the net worked to the corner of the pond and corral all of the fish. About 10 yds from shore fish began jumping everywhere. Some were even successful in clearing the net and reaching freedom. We pulled the net to shore slowly and had nearly 600-700 fish and 2 snapping turtles nearly the size of trash cans. We grabbed the crappie and hauled 320 of them to a friends pond and threw the BG, LMB and CC back. I am sure I will have more details that I will have to edit in but all in all it was a great day. ps NEfish, did I hit all of the important stuff? You pretty much included all the important details, but don't worry I slept great last night and am now fully recovered. A very successful day of pond management was spent removing the competitive crappie and providing abundant resources for the LMB and BG. Oh! these turtles NEDOC speaks of are sure to be cleaned and eaten for the gentleman that euthanized them and took them home, does not kill anything he does not eat! Great report guys. If you have large GC (10 lbs.+) be careful when seining or pulling a gill net. When you trap them in shallow water if there is any room they will try to jump the net. I saw one separated shoulder , and was informed by WF&P fisheries biologist of one broken jaw , one set of cracked ribs and one death by drowning as a result. Not kidding - they go wild when trapped shallow and a 30 lb. GC moving at 20 mph when it jumps the net is dangerous. One knocked a man out who fell out of the boat and drowned before they could get him out. it is almost impossible to pull a 100' net while standing in muck. It must make a lot of difference in the hole size. I have a 100' seine with 1" holes and it isn't that hard to pull. I don't catch the little fish which I'm sure helps. I love to seine as much or more than fishing. It does take practice though. I don't know how you pull it out of the water but one thing I have learned is to drop the end ropes and pull the seine out and set it on the bank as you walk towards the other guy. Does that make sense? It makes it easier to get it back into the water to go the other way. We have 1/4" netting, so that makes it tough to pull. And we have been pulling in silted in ponds. It is very diffucult. When we get to the end, I get on my knees and pull the weighted line into shore. Therefore it is not allowed to lift and leave room for escape. 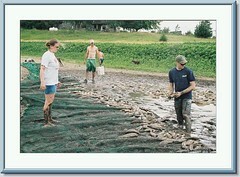 We honestly, pull up several hundred pounds of mud each time we seine these ponds. It is alot of work to clean the net. I have started to lay it under my sprinklers for about 24 hours after each seining. Not to mention rolling it up and getting it in to the back of a pick-up. But well worth the fish caught and "natual" beverages consumed. Next job is to get those trees out of the west finger of your big pond and siene it..start feed training in that corner and we can whipe them out! My seine never catches silt. Does yours have two ropes for the lead line? I think that is supposed to help. ewest - it sounds as though you have some experience with gill nets. Do you have any idea if getting a gill net the proper size to remove my carp and/or catfish would get their #'s under control. This is an idea NEfish and I have been looking into. Any advice would be appreciated. Brian - two ropes for the lead line? I don't understand what you mean. NEDOC I have had some experience with them. They can be used at least 2 ways. Stationary or pulled. Both kill a lot of fish not just carp. We some times deploy one to get out rough fish or to trap them followed by rotenone. 1. Put out the right size net at a good location , for carp where a large shallow water area is constricted on the edge of deeper water. 2. Start at the shore behind the net (shallow side) and with boats and chain or sticks hitting the sides of the boats and the water (noise and vibration) drive the fish toward the net. 3.Follow behind drivers with rotenone poured from boats making a moving line (wave) toward net that will get any stragglers. It will also get other fish not driven out. Step 3 can be skipped if not needed. 4. take the fish out of the gill net and dispose. Repeat in other areas. Only do an area that you can handle. Don't drive carp toward anyone (keep all people behind the drivers)and no one on deep side of the net during the drive. You need to know how to handle rotenone. It should only be used by someone who understands how to use it. If you do that wrong you could kill the entire pond. Easier to drive big fish than pull a gill net full of them 200 yards. I think your seine has a mudline roll at the bottom which makes it stay down. That is why you get so much mud. It does help with getting all the fish in a pull though. Ask Bruce about that. Thanks for the info. You bet we have a mudline. I did not really purchase this seine for the purpose we are using it for right now. Bruce happened to be buying one for his small ponds where the mud line and 1/4" netting was needed, and that is what I will need for my grow out pond in a few years so we split the costs of one. But it is working great if you have enough guys to man it. We really do it more for fun than anything. The top has one rope with floats on it and the bottom has two ropes together and only one has weights on it. I don't know what ewest is talking about being a mudline roll. Is that the same thing? That may be what he is talking about. Use a mud-line instead of a lead-line on the bottom of the net. A mudline is made out of many strands of rope bound together. As the seine is drawn across the bottom, the mud line stays on top of the mud and eliminates the-digging effect of lead-weighted lines. Not sure about the conclusion. I was told they are made by taking several strands of rope and wraping it with extra net on the bottom. Example on a 5 foot seine start with 6 ft and wrap the bottom 1 ft around 4 strands of rope and tie off and you have a 5 ft seine with a mudline. Here is another neat method for harvesting by net. I hope the pic works. Periodic use of a trap-seine will harvest most of the fish from a pond. Generally, a seine 150 to 200 feet long and six to eight feet deep is used for trapping. Set the seine in the water in a location with a smooth bottom 50 feet from shore in an area no deeper than three to four feet (Figure 2). Stretch out the middle third of the seine and coil the remaining sections of the seine at each end. Connect a rope from each coiled end to the shore. 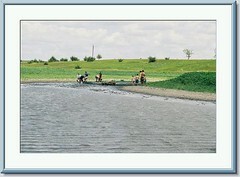 After the seine is set, feed daily between the seine and the pond bank. Sometimes feed must spread on the water outside the catch area to lead fish into the trap. It may take several days, but when the fish are accustomed to feeding between the seine and the pond bank, they are ready to trap. 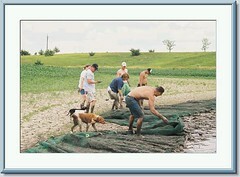 On the day you plan to harvest, feed the fish within the trap area and pull the seine ends to shore. The trap-seine method cannot be used more than once every seven days. Fish that escape harvest become wary of the net and take a while before they will come back to the area. Also, remember, catfish are creatures of habit and you should consistently feed at the same time of day, including the day of harvest. Will leaving a seine in the water that long shorten the life span of the seine? I don't really want to do any damage to a net that is only half mine. I may try this if you don't think this would shorten the life span of the net. Thanks again for all of the help ewest, this has been a very helpful thread for us guys that are inseine. Just leave Bruce's half in the water. I'm positive that it wouldn't damage the seine. Even if it got a little nick in it from a turtle---so what, right? My seine is just like yours except for the mudline and size. I have used it for a blocking net for mths at a time with no negative effect. They are designed and built by people who make saltwater commercial nets. OK NEfish, you heard the boys. Lets Git Er Done. I will start the feeding process by hand TODAY and try to get the net in place this weekend. Next time you are around we will drag that seine through the feeding section. NEDOC, then Aug. 12 should work fine. You two can be like Grumpy Old Men seining in your tuxedos. The bad part is, I could see guys like NEfish and Bruce doing something like that. I am already in trouble with NEfish's fiance because I am trying to get them to just televise the wedding at the local tavern. Im in guys, wedding is at 4:30, pictures at 1:00, we have plenty of time to do a little pond management! Im sure the "nag" won't mind! With that many people invited its the only way to go. Projected on to Maury's wall, it'll be like your sitting in the front row! 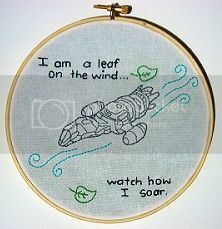 Here are some more that I finally got uploaded. Plus a nice shot of NEDoc! This pic is taken at the start of the finger 200yds away. Here is myself and a gentelman we call "scrap iron" after the long battle with a heavy net. And my lovely wife-to-be even lent a hand.